Chicago Clout inspector General had a little conversation regarding Alderman Edward Burke at the Chicago Board of Elections on Sunday, December 3, 2018. Alderman Brooking appeared on Chicago Clout Can-TV show years ago. 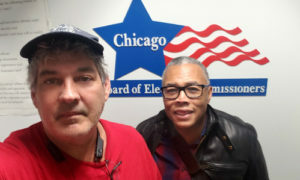 Now Mr. Brooking knows why the Feds are raining alderman Burke’s offices. Thank you Alderman. Previous PostPrevious Please watch this video by Chance the Rapper. Great. With Edward “the diaper” Burke.